Trump Jr. tweeted "you would think a guy like Comey" would know the difference between "hoping and telling"
As FBI Director James Comey's testified about whether President Donald Trump interfered with an investigation into alleged ties between the Trump campaign and Russian officials, the president did not send a tweet. The president's son, Donald Trump Jr., did not show the same restraint. Trump Jr. posted repeatedly during the closely watched testimony Thursday, defending his father and attacking Comey. Trump Jr. in particular seized on Comey's assertion that he interpreted the president's statement that he "hoped" the FBI would drop its probe into former National Security Adviser Michael Flynn. Trump Jr. tweeted "you would think a guy like Comey" would know the difference between "hoping and telling." He also attacked the former FBI director for organizing the leak of a memo that detailed a private conversation between the president and Comey. Comey testified that he felt that releasing the details of his private conversations with the president might prompt the appointment of a special counsel in the case. He said the contents of the memo were released to a reporter by a close friend of his who is a professor at Columbia Law School. "He was more than willing to leak something against @realDonaldTrump but not something that exonerates him? Classy guy," Trump Jr. tweeted. "Once again he's right way before anyone else sees it... and they found another leaker today," he wrote later, citing an earlier tweet by Donald Trump about the "real story" being leaks and surveillance. Trump Jr. also cast doubt on all of Comey's testimony and said he should "have actually followed procedure." 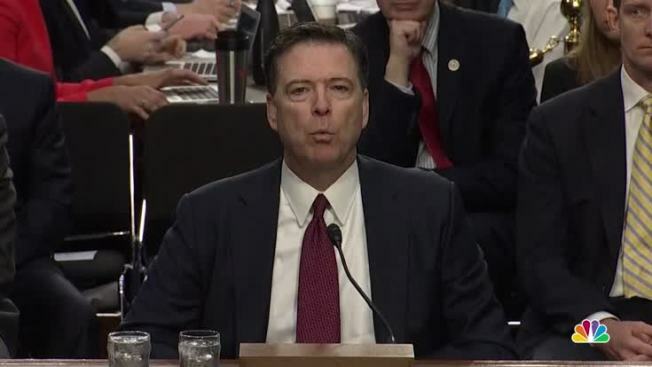 Comey, for his part, accused the Trump administration in his testimony of spreading "lies, plain and simple" about him and the FBI in the aftermath of his abrupt firing, in dramatic testimony that exposed deep distrust between the president and the veteran lawman and threatened to undermine Trump's presidency. Comey disputed the Trump administration's justification for his firing, declaring the administration "defamed him and more importantly the FBI," as he opened his much anticipated first public telling of his relationship with Trump. Comey described discomfort about their one-on-one conversations, saying he decided he immediately needed to document the discussions in memos. President Trump on Thursday afternoon addressed faith-based organizers at the Road to Majority Conference in Washington D.C.
Trump did not directly address Comey's testimony in his remarks, but told supporters "as you know, we're under siege." He vowed to survive and thrive.